In Germany any cake that wants to call itself Schwarzwälder Kirschtorte must contain kirschwasser, a clear spirit made from sour cherries. Don't worry if you can't get that, any kind of cherry liqueur will do, or even plain brandy. 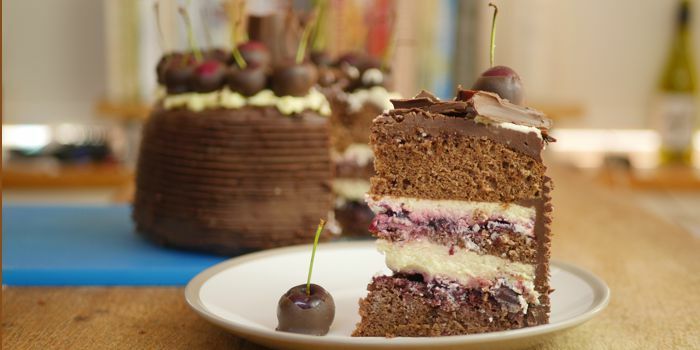 Black forest gateau consists of layers of booze-soaked sponge, cherry jam, cherries, cream, and lots of chocolate. You'll need 2 well-buttered springform cake tins, about 18cm (7 inches) diameter. Preheat your oven to 160° C fan, (180° F) conventional, gas 4. Separate the eggs. Whisk the yolks with the sugar and vanilla extract for a few minutes until they are smooth and creamy. Beat the egg whites to stiff peaks - I recommend a stand mixer for this. Mix together the flour, cocoa and baking powder and stir half of it into the egg yolk mixture. Fold in half of the egg whites, trying not to knock the air out of them. Stir in the rest of the flour mixture, and fold in the remaining egg whites. Divide the mixture between the 2 tins. We want to end up with 3 cakes, so you'll probably want to make 1 cake thicker than the other so you can slice it horizontally. Bake for 20 minutes - the thinner cake should be done after this, the thicker one will probably need 5-10 minutes longer. To check whether the cakes are baked, press the top gently with a finger - if it springs back, it's done. When they are cool enough to handle, remove from the tins and cool on a wire rack. Your cakes will probably have domed tops, so you need to slice these off to get flat tops. Slice the taller cake horizontally. Drain the syrup from the can of cherries and mix half of it with the kirschwasser or cherry liqueur. Paint the tops of your cakes with this boozy liquid - if it starts to ooze out of the bottom, stop! Make up some whipped cream by whisking the cream until it is thick, then whisk in the sugar. Spread one layer of cake with jam, and dot with the cherries from the can. If they have stones in them, you'll want to get rid of those and break the cherries open so they sit flat. Spread just under half of the whipped cream in a layer over the jam and cherries. Place a second layer of cake over the first, and repeat the jam/cherry/cream layer. Place the final layer on top. You might want to put the cake in the fridge for a while at this point while you have a cup of tea and prepare the toppings. In my version of this cake, you coat the top and sides with chocolate ganache, pipe any remaining cream around the edge, Sprinkle the top with chocolate curls and decorate with whole cherries dipped in chocolate. Heat the cream and butter in a saucepan. Don't let the cream boil. Turn off the heat and add the chocolate broken into small pieces. Stir it now and again until the chocolate has all melted, about 3 minutes. Place in the fridge to cool. Break the milk chocolate into small pieces and put them in a microwavable bowl. Microwave for 30 seconds, and stir the chocolate. Microwave again for 20 seconds, stir again. Keep on giving it 20 second bursts until it is all melted. Pour it onto a thick baking sheet and spread it as thinly as you can with a palette knife. Refrigerate until set. Using a flat-ended spatula, push the chocolate away from you - it should form into curls (but might not if the temperature is too cold or too hot!). Put the curls in the fridge until needed. Wash and dry your cherries - if they still have the stalks on, be careful not to break them off. Now you need some tempered dark chocolate. Set aside 3-4 chunks of chocolate and melt the remainder in a tallish, narrow glass using the microwave technique described above. When the chocolate is melted, add the reserved chunks and stir now and again until they have melted too. Now dip the cherries into the chocolate and place them, stalk upwardss, on a plate to set. You don't need to cover the cherries entirely, leave a bit of them showing. Refrigerate to set completely. Remove the cake from the fridge. Place on a turntable if you have one. If the sides are uneven, trim them. Coat the top and sides with a thin layer of ganache and smooth it out as well as you can. Put back in the fridge to set. Take it out again and spread the top and sides with the rest of the ganache. You want to get this top coat as smooth as you can, and if you like you can decorate it using a serrated cake scraper or a fork. Refrigerate to set the second coat of ganache. Put your leftover whipped cream into a piping bag and pipe it around the edge of the cake. Sprinkle chocolate curls over the centre of the cake and place your chocolate-coated cherries around the edge. The video above is from the Keef Cooks YouTube channel. Click here to see the video recipe of Black Forest Gateau on YouTube. If you can't get kirsch or kirschwasser, you can substitute any cherry liqueur. You'll also need 100 grams (3½ ounces) of dark chocolate to coat the cherries with. Prep time: 1 hour. Cooling/setting time: 2 hours. Total time: 3 hours 35 minutes.